Choose an Englewood Health Physician Network specialist and the trained team at Englewood Health’s Wound Healing Center located at Englewood Hospital for comprehensive wound care. 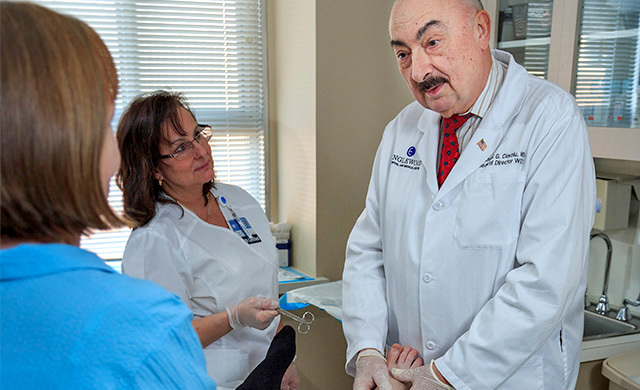 Find treatments to heal your chronic wounds near you in New Jersey and New York. For more than two decades, the Wound Healing Center at Englewood Health has helped hundreds of patients. We have a 94% success rate in improving or healing wounds. Choose our Englewood Health Physician Network wound care team for expert care if you have a wound that won’t heal in four to six weeks. Trust our multidisciplinary team — board-certified wound specialists, vascular surgeons, podiatrists, plastic surgeons, and certified wound care nurses — to help you recover while preventing infection and other complications. Help your wounds heal by increasing the amount of oxygen in your blood stream with hyperbaric oxygen therapy (HBOT), available at Englewood Hospital and accredited by the Undersea & Hyperbaric Medical Society. Ask your doctor if HBOT is right for you.